Background: Myocardial infarction (MI) is one of the leading causes of death. Along with lifestyle factors, poor medication adherence is one of the causes. This study was planned to find out the level of adherence in post-MI patients and its related factors. Objectives: Monitoring medication adherence in patients of MI attending cardiac outpatient department and to reveal causes of nonadherence to drug therapy in them. Methods: One hundred and one newly diagnosed MI patients were included in the study. Data collected were patient characteristics, habits, comorbidities, and drugs prescribed. Morisky 8 item scale was used to find out the medication adherence at the end of 1 st and 6 th month of cardiac event. Data were analyzed using McNemar test, Chi-square test, and logistic regression analysis. Results: Most common preventive cardiovascular drugs given were aspirin, clopidogrel, and statins, 98%, 88.1%, and 90%, respectively. Medication adherence at 6 th month post-MI was significantly decreased compared to 1 st month (P < 0.0001). Factors which were related to good adherence were associated comorbidities such as hypertension (P = 0.017), age group of 56-65 years (P = 0.049), higher education (P = 0.045), employees (P = 0.008), and nonsmoker (P = 0.023). Determinants associated with poor adherence were affordability (P = 0.02) and medication complexity (P = 0.03). Conclusion: Medication adherence in post-MI subjects of our study was seen to be reducing over 6 months due to factors such as low monthly income and low educational status of the subjects. Employed, higher educated, and those with comorbidities showed good adherence. Literature search revealed that studies have been conducted in many developed and some developing countries to evaluate the medication adherence of drugs for secondary prevention of MI. The Prospective Urban Rural Epidemiology (PURE) study  was established to investigate associations between social, behavioral, genetic, and environmental factors and cardiovascular diseases in 17 countries in which India was one among these countries. This study included patients from rural and urban communities in countries at various stages of economic development. To the best of our knowledge and search, a study of medication adherence in MI patients attending cardiology clinics has not been reported in an Indian setting. Hence, we planned to evaluate the medication adherence of post-MI patients in our study setup and to reveal the causes of nonadherence to drug therapy in these patients. The study was started after getting approval (Ref: BVDU/MC/91 dated 03/10/2013) from the Institutional Ethics Committee. It was an observational, prospective, interview-based study. Participants were newly diagnosed post-MI patients who were willing to give consent and were attending cardiac outpatient department (OPD) during February 2014-July 2014 in the tertiary care hospital. During the study period, we could register 101 post-MI patients attending cardiac OPD and followed them up on two visits - 1 st month and 6 th month after their cardiac event. During interview, data were collected on patient demographic details such as age, gender, occupation, address, monthly income, education, personal history, past history of similar episode of MI, family history, and habits such as smoking and drinking, and comorbidities. Drugs prescribed post-MI event were also noted down. Statistical analysis was carried out using IBM SPSS 19.0 (SPSS Inc., Chicago, IL, USA). Chi-square test and McNemar test were used for categorical and continuous variables, respectively. We have used Chi-square test to find the association between adherence with demographic variables (age, gender, education, occupation, co-morbidity, habits, and economic status) and a number of drugs. Binary logistic regression analysis was performed to identify determinants of adherence at 6 months of medication using adherence as dependent variable. All P < 0.05 was regarded as statistically significant. One hundred and one subjects newly diagnosed as MI and admitted in the Intensive Care Unit were registered after they stabilized and these were followed up in the cardiac OPD on 1 st month and 6 th month post their cardiac event. [Table 1] depicts the demographic characteristics of these post-MI patients included in our study. The average age of the patients was 57.8 years, and majority of the patients were from the age group of 36-55 years (n = 46, 45.6%). Male patients outnumbered female patients by double the number. 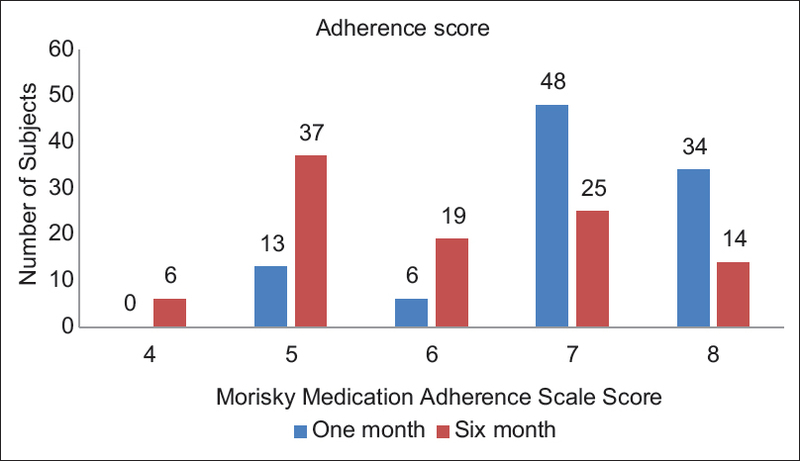 The medication adherence status of the study subjects was calculated as a score below 6 taken as "poor" adherence, whereas the score 6 and above taken as "good" adherence. The [Table 2] shows that medication adherence was significantly reduced from 87.1% at 1 st month to 57.4% at 6 th month post-MI. After applying McNemar test, this reduction in good adherence in the study subjects over the 6-month period was found to be statistically significant (P < 0.0001). This finding can be also appreciated graphically in [Figure 1]. The factors which were found to be significantly associated with good adherence at the end of 6 months post-MI event were age group (56-65 years) (odds ratio [OR] =6.4; confidence interval [CI]: 1-41.6); educational level (graduate and above) (OR = 3.3; CI: 1.0-11.1); employed by occupation (OR = 5.64; CI: 1.5-20.07); having morbidities such as hypertension (OR = 2.75; CI: 1.19-6.307) and diabetes mellitus (OR = 48; CI: 1-227); and nonsmokers (OR = 9; CI: 1.3-60.2). The patients, who reported affordability (P = 0.02) and medication complexity (P = 0.03) as obstacles to medication adherence post-MI, were statistically found to be more likely to have poor adherence. Medication nonadherence is a widespread problem across health care and may reflect discrepancies between provider and patient perception of treatment benefits. It is not only the acute treatment of MI but also long-term medication adherence, follow-up, and lifestyle modification which are equally responsible for the increase in the chances of survival. Here, in our study, we found that at the end of 6 th month of post-MI, the adherence was significantly reduced as compared to the 1 st month (P < 0.0001) [Table 1] and [Figure 1]. A previous study by Eagle et al. on outpatients with coronary disease had also found that only 20% patients consistently take the combination of aspirin, beta-blocker, and lipid-lowering medications. In a population-based study, Ramsay et al.,  documented that <20% of AMI patients use all four of the recommended agents. We examined a breadth of potential patient and provider factors associated with medication adherence. These factors can broadly be categorized into demographic (age, gender, occupation, income, education, comorbidity, and habits), preventive medications, and patient's feedback (determinants/obstacles) to medication adherence. Jin et al. in their review article have shown a correlation between age and nonadherence. In our study, patients with older age (>55 years) were found to be more adherent than patients with younger age (<40 years) (OR = 6.4, CI: 1.0-41.6). This may be because middle age/prime age is the earning class of our society. They are under stress due to their working schedule, which may lead to poor medication adherence and ultimately ignorance to health. In Japan, patients in the prime age of their life (40-59 years) were found less likely to be compliant to the medication (Iihara et al.). Even the PURE study  reported that patients younger than 60 years were less likely to take the drugs than were patients aged 60 years or older (Yusuf et al.). When studied for medication adherence, both the male and female subjects in our study were equally adherent to medication at both the time points, 1 and 6 months post-MI. In the Heart and Soul study carried out for the cardiovascular events, similar results were found. Contrasting these findings, the PURE study  reports that women were less likely to take these effective drugs after coronary heart disease than were men. 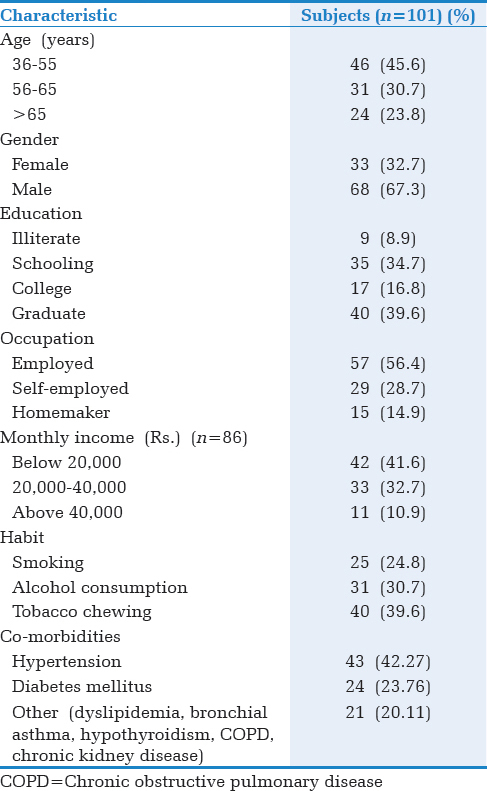 The subjects from the income group, i.e., below 20,000 international normalized ratio (INR)/month were poor adherent as compared to higher income groups (20,000-40,000 and >40,000 INR/month) (P = 0.002) [Table 3]. Fischer et al. in their study examined prevalence, predictors, and outcome of the primary nonadherence, in which they identified that lower socioeconomic status was associated with medication noncompliance. In the determinants of medication, affordability was found to be negatively associated with adherence (OR = 0.6; CI: 0.13-0.89). Predictors of medication adherence, a study by Balkrishnan  found that there is opposite association between adherence and cost of medication. As India is a developing country, the average income of an Indian citizen is comparatively less than that of a citizen from developed countries. Medicines were widely available in India, a low-income country; however, they were not affordable, which was likely due to the low capacity to pay of households. The expenses of medication are high, and most of the patients are not under insurance cover. Furthermore, majority of the patients have associated comorbidities and multiple medications prescribed for these ailments which unintentionally may lead to medication nonadherence. Patients who had comorbidities such as hypertension and diabetes were found to be significantly more compliant to the preventive medications of MI in our study (P = 0.017 [OR = 2.75; CI: 1.1-6.30] and P = 0.048 (OR = 48; CI: 1-227), respectively). In the Jackson Heart Study done in the USA, Addison et al. tried to find out the relationship between medication use and cardiovascular disease health outcomes. They also observed that subjects having hypertension and diabetes had high adherence rate to the medication. Even the PURE study  noted that patients with diabetes and/or hypertension used the drugs more often than did those without these comorbidities. The incidence of these noncommunicable diseases (hypertension and diabetes) is increasing alarmingly in both developed as well as developing countries. Even common man may be knowing the long-term sequelae of these conditions and considering these diseases serious. Taking some additional drugs for the secondary prevention of MI should not have been difficult for them, and this may be reason for the good adherence among these patients. 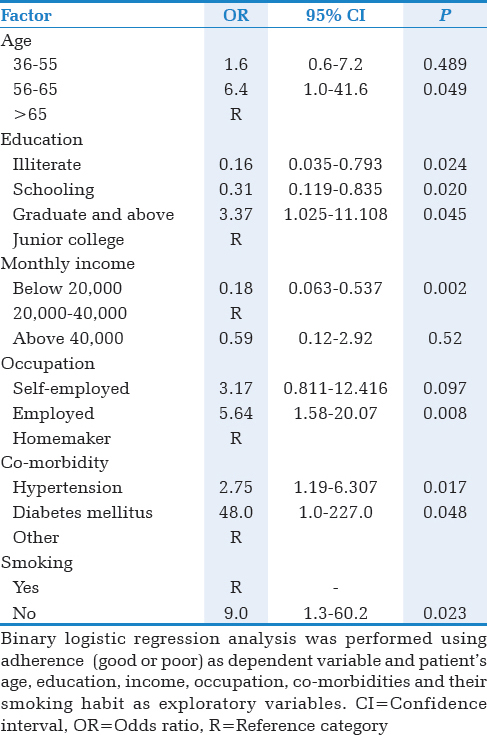 It was found that the employed subjects were associated positively with adherence (OR = 5.64; CI: 1.58-20.07) than self-employed and homemakers to their prescribed medications (P = 0.008) at the end of 6 months. Employed individuals had good adherence as compared to the self-employed ones as there may be good working conditions, good financial state, and more time for self-care available to them as compared to the self-employed and homemakers. Homemakers play an important role as a caregiver of family members in India. Shrank et al. have recently proposed a contributor to medication nonadherence as caregiving status - women are more likely to provide informal care to loved ones and such caregivers have found to be substantially nonadherent compared with noncaregivers. In our study depicting an Indian scenario, homemakers were less adherent to medication as they may be slightly careless about their own health because of involvement of all household activities and taking care of others. In addition, most of the Indian homemakers are not financially independent, and this may be the reason for poor availability of medicines. The role of females is considered secondary to males in Indian culture, and this social impact may lead to poor self-care by women. Future studies should investigate the benefit of various interventions designed to specifically address the factors found to be related to nonadherence. Tailored patient education and predischarge planning, as well as the availability of continued patient interactions with the health system early after hospital discharge and development of cost-effective strategies to improve medication adherence may represent key actionable opportunities to optimize patient adherence and improve outcomes. Due to lack of prolonged follow-up, we were unable to comment on the outcome of the disease due to the medication adherence status. Medication adherence was found significantly reduced at the end of 6 months as compared to 1 st month post-MI in the study subjects. The factors significantly found to be associated with higher adherence were older age, higher education (graduate and above), employed by occupation, better economic status, nonsmoker, and suffering from comorbidities such as hypertension and diabetes mellitus. The significant determinants of poor adherence from the patient's perspective were affordability and complexity of medication therapy. Elliott M, Antman J, Loscalzo J. ST-segment elevation myocardial infarction. In: Jameson J, Longo D, Kasper D, Fauci A, Hauser A, Loscalzo J, editors. Harrison's Principles of Internal Medicine. 18 th ed. New Delhi: McGraw-Hill Medical; 2012. p. 2021-35. Park K. Epidemiology of chronic non-communicable disease and conditions. In: Park's Textbook of Preventive and Social Medicine. 21 st ed., Ch. 6. Jabalpur: Bhanot Publishers; 2011. p. 335-79. Tabor A, Lopez D. Comply with us: Improving medication adherence. J Pharm Pract 2004;17:167-81.
van Dulmen S, Sluijs E, van Dijk L, de Ridder D, Heerdink R, Bensing J. 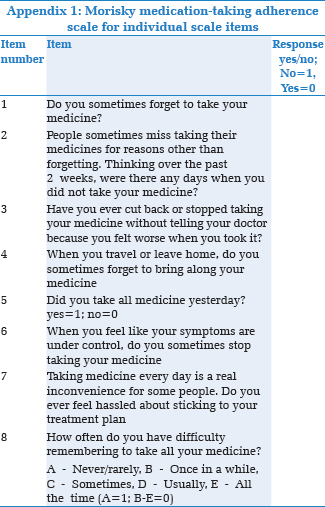 Patient adherence to medical treatment: A review of reviews. BMC Health Serv Res 2007;7:55. Pathman DE, Konrad TR, Freed GL, Freeman VA, Koch GG. The awareness-to-adherence model of the steps to clinical guideline compliance. The case of pediatric vaccine recommendations. Med Care 1996;34:873-89. Peterson AM, Takiya L, Finley R. Meta-analysis of trials of interventions to improve medication adherence. Am J Health Syst Pharm 2003;60:657-65. Rodriguez F, Cannon CP, Steg PG, Kumbhani DJ, Goto S, Smith SC, et al. Predictors of long-term adherence to evidence-based cardiovascular disease medications in outpatients with stable atherothrombotic disease: Findings from the REACH Registry. Clin Cardiol 2013;36:721-7. Yusuf S, Islam S, Chow CK, Rangarajan S, Dagenais G, Diaz R, et al. Use of secondary prevention drugs for cardiovascular disease in the community in high-income, middle-income, and low-income countries (the Pure Study): A prospective epidemiological survey. Lancet 2011;378:1231-43. Lavsa SM, Holzworth A, Ansani NT. Selection of a validated scale for measuring medication adherence. J Am Pharm Assoc 2011;51:90-4. Nguyen TM, La Caze A, Cottrell N. What are validated self-report adherence scales really measuring? a systematic review. Br J Clin Pharmacol 2014;77:427-45. Eagle KA, Kline-Rogers E, Goodman SG, Gurfinkel EP, Avezum A, Flather MD, et al. Adherence to evidence-based therapies after discharge for acute coronary syndromes: An ongoing prospective, observational study. Am J Med 2004;117:73-81. Ramsay SE, Whincup PH, Lawlor DA, Papacosta O, Lennon LT, Thomas MC, et al. Secondary prevention of coronary heart disease in older patients after the national service framework: Population based study. Br Med J 2006;332:144-5. Jin J, Sklar GE, Min Sen Oh V, Chuen Li S. Factors affecting therapeutic compliance: A review from the patient's perspective. Ther Clin Risk Manag 2008;4:269-86. Iihara N, Tsukamoto T, Morita S, Miyoshi C, Takabatake K, Kurosaki Y. Beliefs of chronically ill Japanese patients that lead to intentional non-adherence to medication. J Clin Pharm Ther 2004;29:417-24.
Cooper C, Carpenter I, Katona C, Schroll M, Wagner C, Fialova D, et al. The AdHOC Study of older adults' adherence to medication in 11 countries. Am J Geriatr Psychiatry 2005;13:1067-76. Kulkarni SP, Alexander KP, Lytle B, Heiss G, Peterson ED. Long-term adherence with cardiovascular drug regimens. Am Heart J 2006;151:185-91. Nichols-English G, Poirier S. Optimizing adherence to pharmaceutical care plans. J Am Pharm Assoc (Wash) 2000;40:475-85. Fischer MA, Choudhry NK, Brill G, Avorn J, Schneeweiss S, Hutchins D, et al. Trouble getting started: Predictors of primary medication nonadherence. Am J Med 2011;124:1081.e9-22. Balkrishnan R. Predictors of medication adherence in the elderly. Clin Ther 1998;20:764-71. Khatib R, McKee M, Shannon H, Chow C, Rangarajan S, Teo K, et al. Availability and affordability of cardiovascular disease medicines and their effect on use in high-income, middle-income, and low-income countries: An analysis of the PURE study data. Lancet 2016;387:61-9. Addison CC, Jenkins BW, Sarpong D, Wilson G, Champion C, Sims J, et al. Relationship between medication use and cardiovascular disease health outcomes in the Jackson Heart Study. Int J Environ Res Public Health 2011;8:2505-15. Crowley MJ, Zullig LL, Shah BR, Shaw RJ, Lindquist JH, Peterson ED, et al. Medication non-adherence after myocardial infarction: An exploration of modifying factors. J Gen Intern Med 2015;30:83-90. Mathews R, Peterson ED, Honeycutt E, Chin CT, Effron MB, Zettler M, et al. Early Medication nonadherence after acute myocardial infarction: Insights into actionable opportunities from the treatment with ADP receptor iNhibitorS: Longitudinal assessment of treatment patterns and events after acute coronary syndrome (TRANSLATE-ACS) study. Circ Cardiovasc Qual Outcomes 2015;8:347-56. Shrank WH, Liberman JN, Fischer MA, Kilabuk E, Girdish C, Cutrona S, et al. Are caregivers adherent to their own medications? J Am Pharm Assoc 2011;51:492-8. Ingersoll KS, Cohen J. The impact of medication regimen factors on adherence to chronic treatment: A review of literature. J Behav Med 2008;31:213-24.